Although the city celebrated the event on Saturday, the official day for Juneteenth (June 19) is today. On Saturday the city got it’s first taste of soul vocalist Frank McComb, who was part of the free festival. The concert was held not too far from the Jerry Rescue Freedom Statue in historic Clinton Square. Physically McComb resembles bassist Chris Walker and radio-personality Doug Banks. 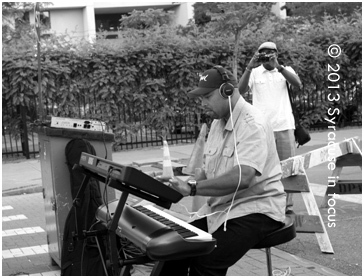 He has his roots in gospel and dabbles in jazz, but he has a vocal and playing style most reminiscent of a mid-80s Stevie Wonder (or some at the venue said Donny Hathaway). 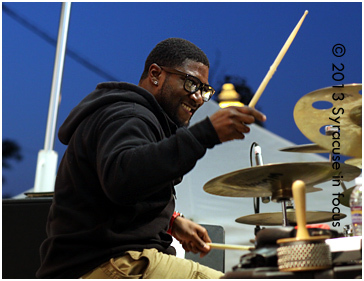 McComb further showed his generosity by choosing a few Syracuse-area musicians to share the stage and play during his set (including beast of the beats Stephen Bender and Brownskin Band’s Nate Brown). Although the show stared a little late, the crowd had no problem following his groove. Syracuse-area drummer Stephen Bender was invited to play the set with McComb. According to a promoter at the show, look for McComb to make a return to the area in September. McComb warms up backstage before his set in Clinton Square. This entry was posted on Wednesday, June 19th, 2013 at 8:59 pm and is filed under Music. You can follow any responses to this entry through the RSS 2.0 feed. You can leave a response, or trackback from your own site.